Beirut-born and raised, Dubai-living, Photographer-Jewellery Designer Nadine Kanso has us under her spell. Throughout the beginning of her career, she worked in various fields, including journalism ad advertising design, all the while alongside projects exploring her passion of photography and jewellery design. Her career path changed when Nadine was invited to participate in the “Arabize Me” group exhibition at the Victoria and Albert Museum in London in 2006. As a result, this same year, Nadine launched the first piece of her jewellery line: “Bil Arabi” which translates to, ‘in Arabic’… in Arabic ;-). Nadine specifically wanted to go beyond the traditional but significant meaning of a ring, when creating her first, and iconic piece; the basic: married – or single element. She wanted her rings and her jewelry to say more: a personal and cultural message. 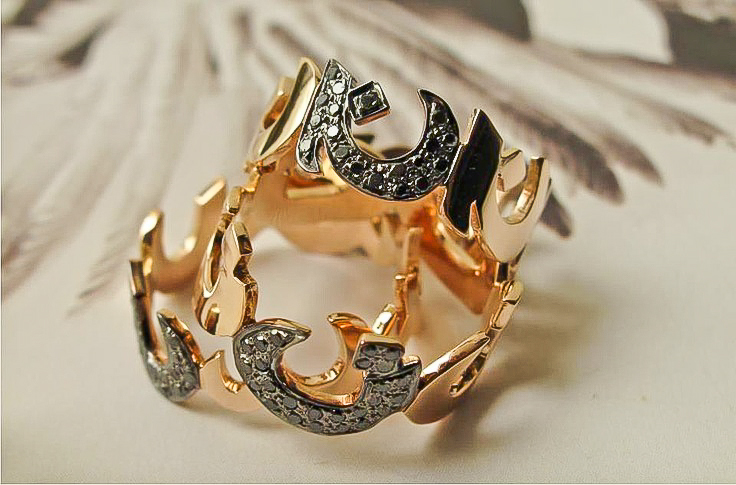 This first piece/ring was “n” translating to noon in Arabic and from there evolved to other words and phrases, elegantly and boldly speaking their truths in a cultural context. Through her design and bi-coastal upbringing, which has become a norm in the modern Arab world, Nadine is continuously exploring self and cultural expression of being Arab in society through not only her jewelry, but her photography as well. Continuously inspired by the beautiful calligraphy of Arabic script, Nadine uses this as the foundation for her designs, sprinkling her creations with a potpourri of precious and semi-precious gems on white, yellow and rose gold canvases. We look forward to more of Nadine’s jewellery art, as she continues to explore, and in turn bring light to the beauty and culture of the Arab woman and world. Images courtesy of Bil Arabi and Lyla Loves Fashion. Arabic Script in its self is phenomenal, and for Nadine to take it to another degree…. BOOM! I like the track that Bil Arabi is taking. That second ring is sick with the Arabic script creating the cradle for the stone! Home run on that joint! Fire,Flame! Nadine’s pieces are gorgeous! I love how her concept is just so simple and yet so out of the box. It’s like calligraphy in motion. 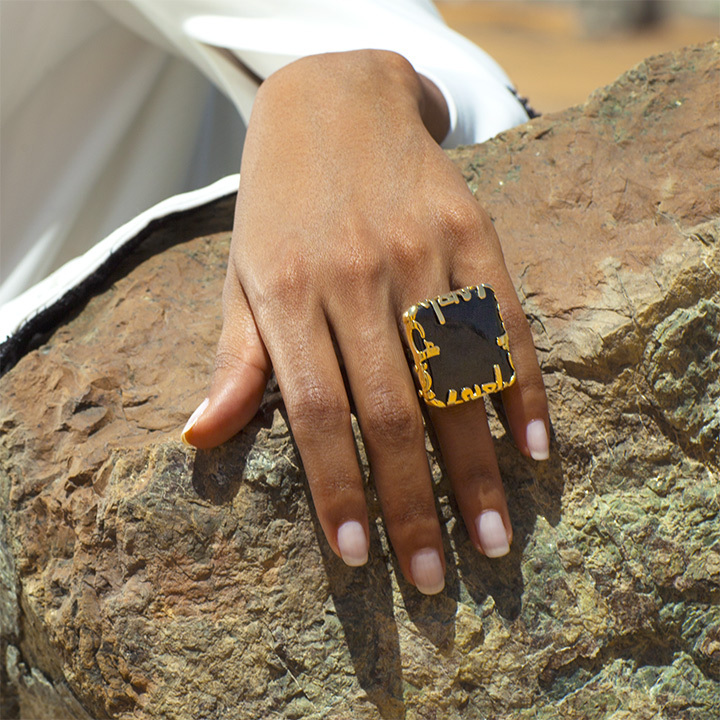 What I like most is that to a non-Arabic speaking customer, her pieces could represent intricate geometric shapes and elegant bordering to showcase precious stones. I just can’t get enough!!!!! Loving this collection! Hope to see more of Bil Arabi! Thank u @Sebastien! She’s lovely!